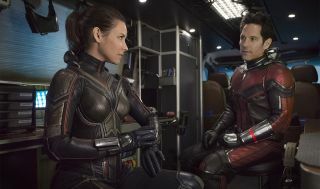 It was the question on everyone’s lips: just where were Scott Lang and Hope van Dyne (AKA Ant-Man and the Wasp) during the events of Avengers: Infinity War? Now, thanks to the movie and its post-credits scenes, we have an answer. It goes without saying MASSIVE spoilers follow, so if you don’t want to know anything go into the movie, look away now. No, really? This is big. The events of movie cover everything that happened pre-Thanos’s invasion of Earth, Scott and Hope – as pretty much everyone guessed – were busy combing the Quantum Realm for Hank Pym’s wife (and original Wasp) Janet van Dyne, played by Michelle Pfeiffer, as well as dealing with the villain Ghost’s plans to take some of the quantum energy to heal herself. Scott only hears static at the end of his communication system in the Quantum Realm, but the camera cuts to the ash-filled scene where Hope, Janet and Hank were formerly standing. Yes, I said ash. You can watch the dramatic moment for yourself here, thanks to a naughty, naughty leaker. Though, be warned, it’s liable to be taken offline at any point. They’re gone. Hope, Janet and Hank have been killed off by Thanos’ Infinity Gauntlet. The post-credits happened simultaneously with Avengers: Infinity War’s big moment – and now Scott is on his own in the Quantum Realm. What this means for Scott, who may or may not be trapped in the Quantum Realm post-Infinity War, is up in the air. We do now know, however, that he’s got a lot to fix, and he’s all on his own. Roll on Avengers 4, eh? I didn't think it'd be possible, but this just made the Infinity War ending even more heartbreaking, didn't it?